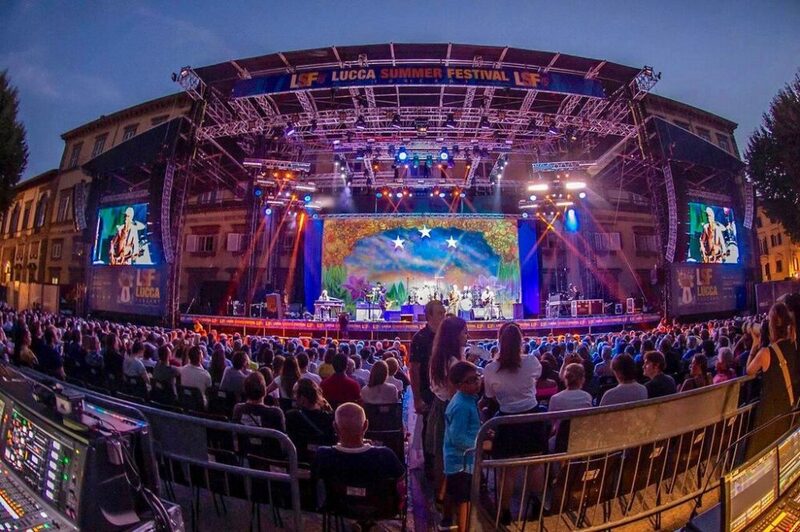 LUCCA, Italy – An Outline PA was supplied for the 2018 Lucca Summer Festival. Although Florence and Pisa without doubt top Tuscany’s tourist charts, Lucca (with traces of Iron Age settlements, good wines and more) is well worth checking out and music fans have the ideal chance to do so during the annual Lucca Summer Festival, organized by D’Alessandro & Galli in the city’s main square. The Festival’s 2018 edition was a particularly high-profile showcase for loudspeaker manufacturer Outline and the ideal debut of new-born rental firm VVP International Ltd., since, apart from Roger Waters, who performed in another location, the cast on stage featured a wide range of music genres: from California’s stoner rock with Queens of the Stone Age, the latest (triple-drummer) incarnation of Prog Rock icons King Crimson, Joe Perry, Alice Cooper and Johnny Depp’s Hollywood Vampires, Ringo Starr and His All-Starr Band, jazzy-pop songstress Norah Jones with a funky Marcus Miller band, James Taylor and Bonnie Raitt, and Italian chart toppers Gianni Morandi, Max Pezzali, Nek and Francesco Renga and Caparezza. LSF, a key gig on Europe’s summer festival circuit, was chosen as a launching pad by well-known industry figure Vincent ‘Vinnie’ Perreux for VVP, his ‘dry hire’ company, founded just before the event with an Outline-only ‘rack & stack’ stock. Perreux designed the sound reinforcement system for the venue and his firm was responsible for the PA and FOH audio management for all the shows staged on the square’s huge stage. The set-up deployed to cover the packed venue consisted in nine Outline GTO and a GTO-DF for each of the two main hangs, six GTO in each of the two side hangs and a L/R centre cluster with two groups of four Mantas 28. The bottom end was handled by sixteen ground-stacked DBS 18-2 subs and four LAB 21 Infra Subs. Ten LIPF-082 front fill speakers were atop the DBS. Control was courtesy of Outline’s new Newton (FPGA-based) audio control and networking system and an analogue matrix controlled by the Outline iP24s. All the signals were fed via Dante with an analogue backup from the drive rack to the amps, twelve Powersoft X8 units. In spite of initial doubts with aspects such as the fact that two of the band don’t wear IEM and the amount of guitar amps on stage, FOH engineer with the Vampires of Hollywood, John Shipp was very pleased with the results and enthused regarding the PA’s perfect performance, doffing his hat to Vinnie and how he deployed the system, ensuring perfect coverage and intelligibility. Shipp was also very impressed with the cardioid sub configuration, which avoided the beefy low end in the house rolling back onto the stage. After decades as a record producer and engineer Chris Porter has been mixing FOH for King Crimson since 2016, so, being so new to mixing live, he relies to a great extent on the experience of his colleagues, Dave Taylor (systems tech) and Russ Wilson (monitors).